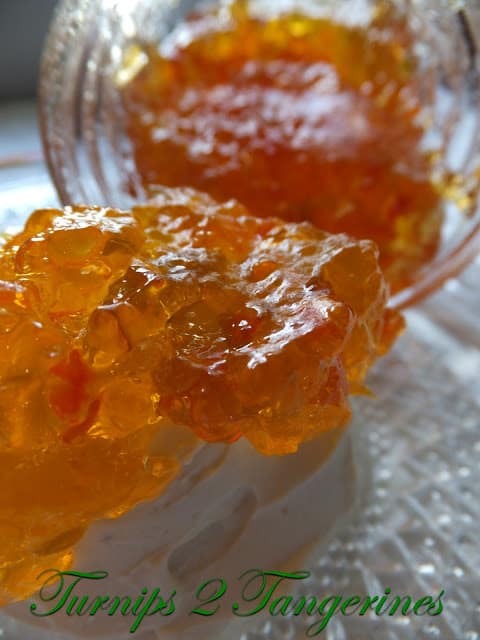 What makes this jelly so special? The 3 shots of Tequila! Why 3 shots of Tequila you might ask, well because ♫One Tequila♪ Two Tequila♪ Three Tequila♪ Floor♫ This is a nice, spicy jelly with a fruity aftertaste. The alcohol from the Tequila evaporates during the cooking process and the flavor left behind from the Tequila is a mellow, earthy, fruity flavor. Tequila Cranberry Pepper Jelly is fruity, tart and spicy. Perfect anytime! I’m not sure where this ‘recipe’ came from or who ‘invented’ this ‘recipe’ but I sure wish I would have! Talk about easy and it’s super good too! The first time I had this dip/spread I was at my brothers house. My niece had graduated from high school and they (my brother and sister-in-law) were throwing a big wing-dig for her. Sitting on one of the many tables lined up around the room, all overflowing with food, sat a block of cream cheese with something green spooned over it. Hmm, I must say I was intrigued. Someone I didn’t know was standing by the unusual looking appetizer and I asked out loud to no one in particular, “How in the hell do you eat this?” The person I didn’t know answered, “You spread it on crackers…it’s hot pepper jelly over cream cheese.” Well, I’ll be dogged. Since I’m the kind of person who will try anything at least once, I dug in. As I’m sure everyone in the universe can testify to, cream cheese with hot pepper jelly is pure joy! Place cranberry juice and jalapenos in a blender; cover and process until peppers are fully chopped. Strain through a double thickness of cheesecloth. Pour the strained juice into a Dutch oven; Add the vinegar, tequila, hot sauce and lime juice. Stir in the sugar. Bring to a full rolling boil, stirring constantly. Stir in the pectin; return to a full rolling boil. Boil for 1 minute, stirring constantly. Remove from the heat; Skim off foam. Carefully ladle hot mixture into hot sterilized half-pint jars, leaving 1/4 inch headspace. Wipe rims and adjust lids. Process for 5 minutes in a boiling-water canner. With tongs, carefully remove jars from canner. Set jars upright on a kitchen towel. Spread soften cream cheese on a serving plate. 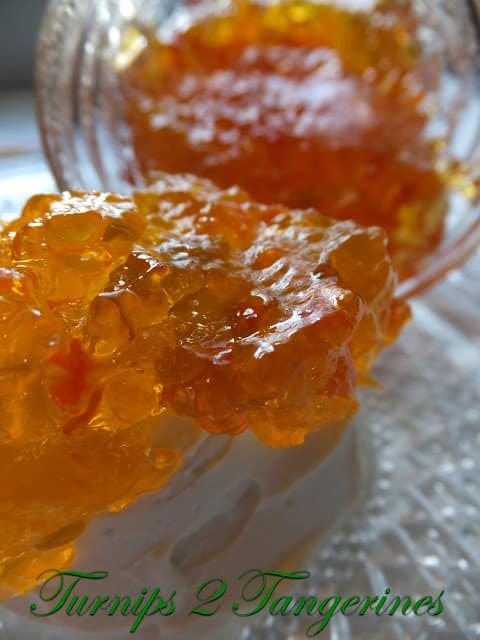 Spoon pepper jelly over cream cheese. Serve with crackers and/or pretzels. Field Trip Olde World Pastries is a fantastic bakery that sells Old World Style Danish Kringle. Am I missing the yield for this recipe? How many half-pint jars does this make? Thanks! 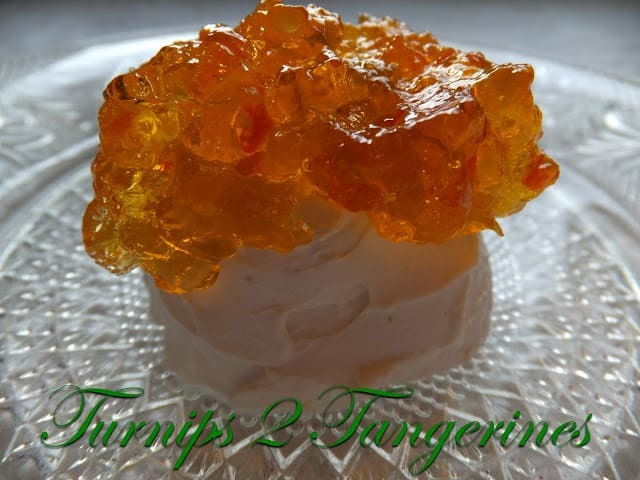 Pepper Jelly over cream cheese is a popular thing around here. I think it is so creative of you to use tequila and twist things up! Cool! Thank you for linking, Lynn. I love Pepper Jelly. And yes, Lynn, should I have 3 shots of Tequila I would be on the floor .. Ha ! Sounds delicious. Thanks so much for joining us at the Let's Get Social Sunday linky party. Have a wonderful week!